Leighton Fun Runners helped reunite an elderly lady with her stolen handbag while they were on a Plogging Run on Saturday, March 31. The group and volunteers were taking part in the run where you pick up litter as you run when one of the runners found a handbag in the undergrowth on Wing Road. There was a a purse in the bag with credit cards, photos and a driving licence with the address of an 87-year-old lady who lived locally. Jennifer Garner, one of the club’s committee members, said: “One of the Ploggers took the bag to her and explained where it was found and why Leighton Fun Runners were there. It emerged that unfortunately it was stolen from her trolley while she was shopping the day before. “She was extremely grateful for its return explaining that the missing money was an irrelevance, but sentimental photos can never be replaced. 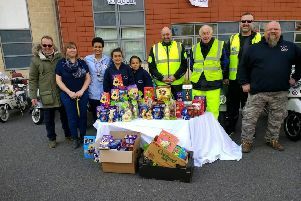 She and her husband wanted to pass on her appreciation to the club and everyone involved for going the extra mile to help tidy up the community. The chairman of Leighton Fun Runners came across Plogging and after positive feedback from members they decided to do one in Leighton Buzzard. Morrisons provided gloves and bin bags for the runners.